The Noble Shaykh Nu'maan al-Watr (May Allah Preserve Him), from the mashaayikh of Ba'daan, Yemen in the district of Ib, and head of Dar-ul-Hadeeth there will deliver a LIVE Tele-Lecture, organized by Muwahhideen Publications on Sunday 10th November 2013. The Shaykh will address us regarding a magnificent hadeeth of the Messenger (sallAllaahu ‘alayhi wa sallam). This event will be broadcast LIVE in Masjid Ibn 'Abbaas, Tobago, two masaajid in Trinidad, Masjid ul Khaleefah and Masjid us Sunnah, and six masaajid in the U.S. Masjid Al-Bukhaari, Florida, Masjid Ibn 'Abbas, Georgia, Masjid Nur Allaah, New York, Masjid as-Sahabah, Ohio and Masjid Tawheed, Michigan. 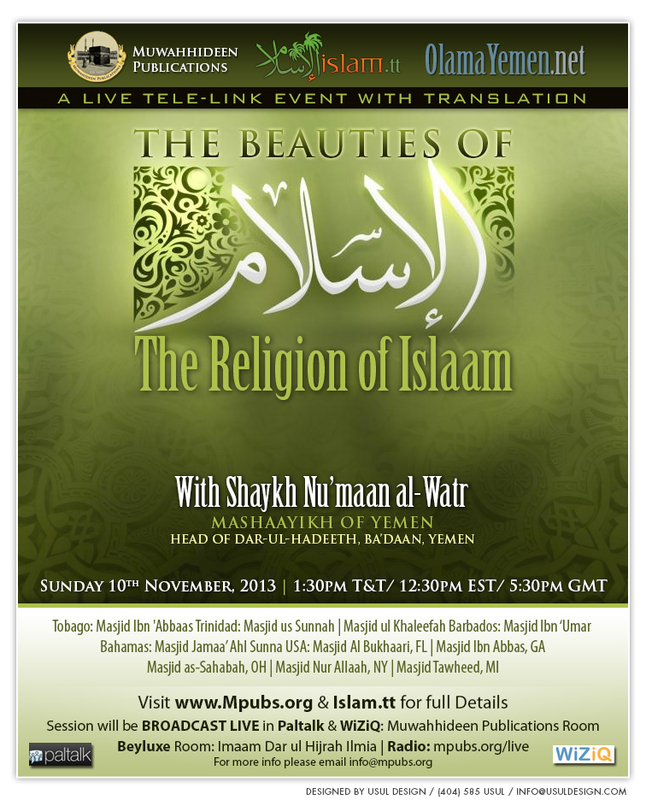 This lecture event will be translated LIVE into English In shaa Allaah.